Judge made his pitch to Machado before Wednesday’s spring training game. “He just kind of laughed it off and didn’t really say much,” Judge said. Opening Day is TWO weeks away from tomorrow and the people down at Spring Training needs to create some headlines to sell clicks. Major League Baseball is UPSET that Aaron Judge PUBLICLY talked about a conversation that he had with the Orioles STAR player Manny Machado, who is going to be a free agent at the end of the season. MOST Yankee fans have known for about THREE years that the Yankees were going to try to SIGN Machado when he becomes a free agent, so no one was SURPRISED that Judge is trying to COURT him, but it PISSED OFF the MLB. 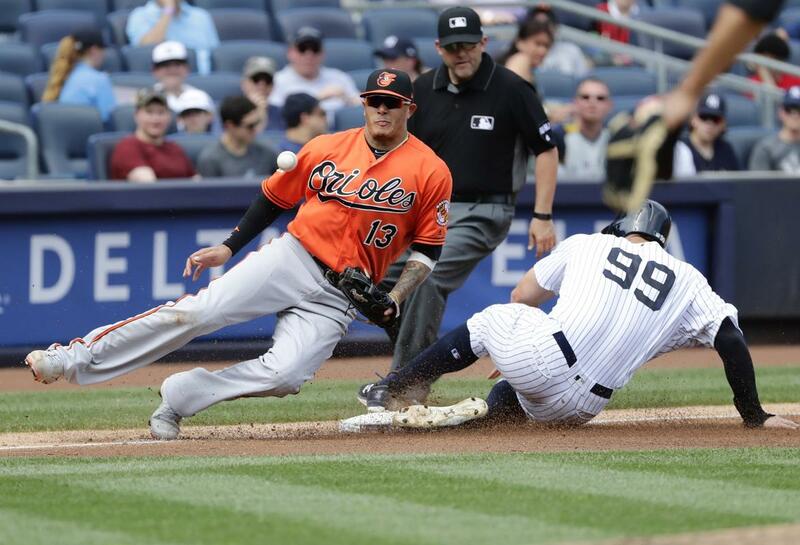 Machado has worn a BUNCH of Derek Jeter gear in PUBLIC this offseason, so even he knows that he wants to go to the Yankees, so I do not understand what the BIG deal is about them talking about it publicly. I would be SHOCKED if Machado does not end up with the Yankees next offseason, so Aaron Judge is just STARTING the proceedings a little EARLY. I really HOPE that Aaron Judge does NOT face any discipline for his comments, but if he does, even though I have NO money, I will start a Go Fund Me in order for Yankee fans to pay his fine.